Often heard, but is this true? Many people can correlate their pain getting worse with the weather being cold, but why is this, and is there any causal reasoning for it? Can we actually “feel it in our bones”? 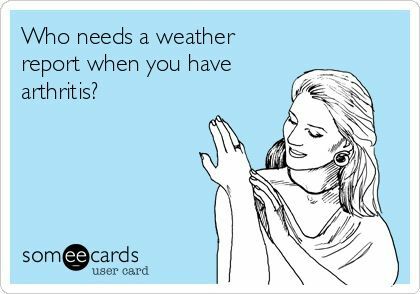 This study concluded that “data supports the belief held by many osteoarthritic patients that changing weather patterns influence their pain severity.”. Again, this talks about the belief that weather effects pain, more than a robust reasoning. The most common reasoning is to do with Barometric Pressure. Barometric pressure is the weight of the atmosphere surrounding us. If we imagine the tissues surrounding the joints to be like a balloon, high barometric pressure that pushes against the body from the outside will stop the tissues from expanding. If however, barometric pressure drops – before bad weather sets in, for example – this lower air pressure pushes less against the body, allowing the tissues to expand – and these expanded tissues can put pressure on the joint and nervous system, causing pain! This is similar to our legs swelling on a long-haul flight, again associated with the drop in pressure. This is all very hypothetical, and research is very much in the “we don’t know” area – however consistent grandmas knee seems to be! Cloudy With A Chance Of Pain is the world’s first smartphone-based study to investigate the association between weather and chronic pain. Data collection for the site began in January 2016 and ended in April 2017. They are now analysing more than five million pieces of symptom data submitted over 15 months alongside comprehensive weather data from across the UK. It will be interesting to see their results, due in Spring 2018! This entry was posted in Uncategorized on 1st March 2018 by DCInjuryClinic. During the winter months, a weekly occurrence in clinic will be someone booking an appointment either due to a last-minute injury, or more often a last-minute concern, before heading off on their winter ski/snowboard holiday. As is the way with a lot of endurance based sports, a lot of ski-injuries can be traced back to the onset of fatigue. We tire – we lose focus (or ‘form’). Specific training can help reduce your chance of getting injuries whilst away, but they can also be used pre-emptively, to try and ensure that you enjoy your time away by limiting the aches and niggles that can sometimes plague winter breaks. Of course, it makes sense to concentrate on improving our aerobic capacity before we leave, which means getting out of breath a few times a week. This is particularly important for skiing due to most resorts – naturally – being at altitude where air is thinner. It would generally be recommend that you give yourself a good 8-12 weeks pre holiday to get yourself ski-fit, but even if you fall within that window, it is still recommended that you utilise your time wisely. If we want to avoid as best as possible those burning thighs on that long red run home and tired aching muscles the next day, we need to work on our leg strength – specifically our quadriceps (thighs), the gluteal muscles (backside) and calves. Core muscles shouldn’t be neglected either, but I find these to be best worked as compound exercises rather than in isolation. Stance – or balance – is important whether you are skiing or boarding, which is why I, generally speaking, like single leg work. Below are a few exercises that may be useful if you are heading to the slopes soon; they all focus on strength, core, balance and posture, all key when trying to avoid injury when skiing or snowboarding. This entry was posted in Uncategorized on 16th February 2018 by DCInjuryClinic. Early in my journey (how X-Factor) to retrain as an injury treating chap, I “knew” everything. I signed up for courses, I studied hard, I dedicated hours learning the recommended texts, and I passed the tests. But soon after my first qualification, out in the real world, trying to positively effect peoples lives, seeing the results (good and bad) I began questioning. Why is what I have been taught the way? Is what I’ve been taught the way? So I read more. I worked harder. I placed myself in uncomfortable discussion and situation. I ensured I found myself in rooms with people infinitely smarter than myself. I started questioning everything. I learnt things I didn’t know I didn’t know. And now, I see this as the single most important part of my progress; critical thinking. And today, I “know” – for sure – less and less. But I see this as a good thing. It taught me of the perils of confirmation bias; of seeing what you always see, because that’s what you always see. If you only converse with people that see the world exactly as you see it, or work with people that you have trained yourself, then your window of vision narrows. In my previous career, I always found it hard to work with people who struggled to admit “I didn’t know that”, as if it were some kind of weakness. Being challenged is a good thing, it has to be, and I encourage this in my clinic. Ask me why this is your treatment. Ask me what these exercises will do for you. Ask me why I think how I think. Nothing grows in a comfort zone. In similar vein, a hugely important process I went through was that admission of not knowing everything, and actually, admitting to myself that some of what I thought I knew was wrong. No one knows everything. How could they? I look back at those initial treatments I carried out and some make me cringe. Not because they were bad treatments necessarily, but because they were the wrong treatment, for the right person. Because what I thought was right, I now don’t. And I can hold my hands up to that. Everything in life is a lesson; good, bad, indifferent. Now, no-one likes being told, or finding out, they are wrong, and the transition was hard. I wanted to believe that the skills I had been taught were beneficial, that they were helping people, and this is one of my bugbears with my profession today. People pay huge amounts of money to do courses, so naturally do not want to know that what is taught may not be exactly evidence based. But that certificate does not give us carte blanche to do as we please; we still have an ethical responsibility to follow the evidence, to stay current with the evidence, and to be able to justify what we do. These things outweigh the cost of a course. The weight of evidence, and my own clinical experiences, showed me that I simply couldn’t justify some of the things I had been taught. Don’t get me wrong, they are still taught on courses up and down the country, and they will still be carried out in clinics everywhere. I just chose a different path, I guess. …what a link! Ok, this is one for the Disney completists, but it is the current favourite in the Clayton car, and so definitely counts. A message we could all learn from. Its ok to be wrong. Its ok to make new mistakes, as long as we try to limit making the same mistakes. I am often told that my clinical approach is different from many have experienced elsewhere, as I put a lot of emphasis on self-management, empowerment and education. This comes at a risk, because we know that a lot of information given out on clinic can be misunderstood or in some cases, instantly forgotten. So I always tell people its ok to make mistakes, to try slightly different things, but to stay focussed, and positive, on the outcome. Recovery is never a linear road, and there are often bumps along the way. As long as we get back up when we ‘fall’, this is ok. And this is also true of my profession; I recently read an article that suggested that the average career span in my profession is less than 1 year. You read that correct. LESS than ONE year! Now, I have my own opinions on why exactly this might be – opinions which are long and varied and probably not popular – but one thing I think we all need, in all walks of life, is perseverance. Of course I am very proud of my clinic now, but it wasn’t a case of qualifying on Sunday and being fully booked on Monday. I started with one, non-paying, client. I thought about giving up more times than I (and my incredibly supportive wife) can remember. As Richard Branson says, “it take years to become an overnight success”. I love my girls singing this one on the way to school. Strong lyrics. Recently Bath Half Marathon was in the headlines for all the wrong reasons. The organisers had ordered circa 12,000 medals, but 12,700+ finished, meaning a lot of unhappy runners wanting their well deserved bling. And it got me thinking; would I have been upset? Why do I run? I’m certainly not a competitive runner, so its not the winning. I’m not particularly unhealthy, so its not health related. I enjoy running on my own, so its not the social aspect. And I’m not a medal collector, so its not the medal. I should say, all of the above reasons are great reasons. But, for me, its an intrinsic drive to push myself. I come from a 25 year competitive sport background, and it becomes who you are.I want to run a little further. A little harder. A little faster, even (I know, we’re not allowed to admit this last one…). Its like an internal alarm clock that nudges me if I haven’t been running for a few days. And its the same professionally. Why do I lie in bed reading about medical conditions that I may see in clinic once a year (once in a lifetime, some of them)? Why don’t I put up every certificate I have? Do I even tell people what I have recently qualified in? I have a theory that we all suffer a little bit of Imposter Syndrome – an intrinsic need to always prove oneself, and improve oneself? I’ll always want to be better at what I do. The day I don’t, is the day I’ll shut up shop and hang up my running trainers. “It means no worries, for the rest of your days”. I literally didn’t know that. This entry was posted in Uncategorized on 23rd December 2017 by DCInjuryClinic. TE may cause pain to radiate down the forearm, and in some cases, cause pins and needles in the hands and fingers. Similar to Golfers Elbow, Tennis Elbow does not just afflict the tennis players it is associated with. It in fact affects about 3% of the population and I see it most often as an occupational condition, with sufferers often manual workers, but also in gym-goers and weight lifters. It is equally common in men and women, peaking between the ages of 30 and 50. 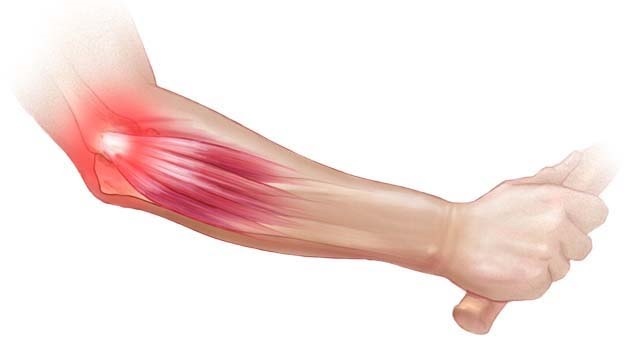 Ordinarily, TW usually begins as inflammation of the tendons of the forearm as they attach to the humerus (upper arm) bone, just above the elbow joint. This inflammation is usually caused by gripping activities such as hammering, screw-driving, drilling, weight lifting, digging in the garden, driving and – naturally – racquet sports. In advanced conditions, simple activities such as gripping a door handle or opening a jar can be excruciating. NB: It is important to remember that pain in the elbow region can be a referred problem from the neck or shoulders, and these should be examined in order to eliminate them before a diagnosis of Tennis Elbow is made. The first thing to do with any acute injury is the P.O.L.I.C.E procedure, to enable some level of pain management. As with GE, we need to assess exactly which of the soft tissues are the guilty suspects; to loosen any excessively tight areas, and ease the load of overworked muscles which may mean (short-term) amendment of offending activity. There may also be a need to correct any potential biomechanical issue creating a problem, which will often include a graded and relevant strengthening programme. As TE is a tendinous condition, an isometric (static) programme is usually an initial approach (Ref 1), followed by a specific eccentric (lengthening) programme (Ref 2). This entry was posted in Uncategorized on 1st December 2017 by DCInjuryClinic. Osgood Schlatters (OS) is a condition that is extremely common in adolescents at the time of a growth spurt. Ages vary, but generally speaking, boys may suffer between the ages of 13 and 15, whilst girls may be in the 10-12 category. It is usually associated with repeated forced knee extension, or high impact activity in sports such as football, basketball, or running. Named after two physicians, Dr. Robert Osgood and Dr. Carl Schlatter, a typical case of OS will reveal itself as a bump, or lump just below the kneecap – people sometimes liken it to a second knee (see image below). The primary symptom of Osgood Schlatters is typically pain at the tibial tuberosity (the bony bit at the top of the shin bone). 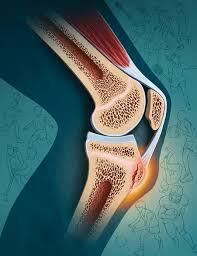 This tibial tuberosity may become swollen or inflamed, resulting in this aforementioned lump/bump. Tenderness and pain is worse during and after exercise. The athlete is likely to experience pain when contracting the thigh muscles or performing knee bending activities. There may be subsequent muscle tightness around the joint. OS is a self-limiting condition that generally settles with the bony fusion of the tibial tubercle (Ref 1), which may thicken long-term. Because of its self-limiting nature, education is key in its management as symptoms may persist for up to 2 years. Other management strategies include activity modification. The key word here is modification, as there is “no evidence that rest accelerates the healing process” (Ref 1). Pain should be the main guide with regards to level of activity. As the quadriceps appear to be key contributors to the condition, soft tissue therapy alongside a graded programme of stretching and strengthening can be helpful. Some people find the P.O.L.I.C.E approach helpful. This entry was posted in Uncategorized on 27th October 2017 by DCInjuryClinic. I always feel very privileged that people entrust me with their most prized possessions – namely the health of their children! I work with a huge number of children and adolescents, and so I thought I would write a few blogs on a few conditions that are unique to that age group. I will look at hip, knee and heel pain. First up, hip pain, and more precisely – Perthes’ Disease. 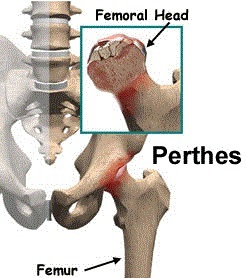 Perthes disease is a childhood disorder which affects the head of the femur – the thigh bone. 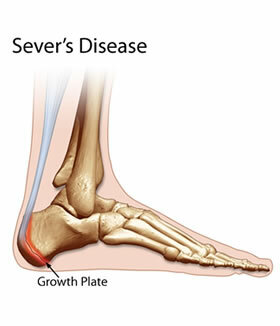 In Perthes disease the blood supply to the growth plate of the bone at the end of the femur (called the epiphysis) becomes inadequate and as a result the bone softens and breaks down (a process in adulthood called avascular necrosis). The condition typically occurs in children who are between 4 and 12 years old, and it is up to five times more common in boys than in girls. Approx. 1 in 9,000/10,000 children are affected, so it is rare. It usually only affects one hip, but both hips are affected in about 1 in 7 children with Perthes’. The cause is not entirely clear. It is not due to acute injury, or a vascular problem, and a child with Perthes’ disease is ordinarily fit and well. Some research suggests it that there may be a genetic link, but this is far from conclusive. Pain that worsens with activity and is relieved with rest. Muscle wasting in the thigh of the affected leg. Shortening of the affected leg. Depending upon the length of time your child has been suffering, and on your child’s activity level, symptoms may come and go over a period of weeks or even months. The long-term prognosis for children with Perthes is good in most cases, although it has been linked with arthritis in later life. As always, if in doubt, get it checked out. This entry was posted in Uncategorized on 13th October 2017 by DCInjuryClinic. This is a great thought-provoking Guest Blog, by Bec Connolly: Boxer, Personal Trainer, Nutritional Coach, Runner, writer & Mother of Four with a passion for sport, good food & positive people. Nutritional based medicine….time to listen yet??! Right, so been writing a lot on nutrition lately and have been having a number of interesting discussions on the subject in relation to both medicine-Prevention, treatment and cure, and general wellbeing. So thought i would add a blog in (i know so many people are asking for video blogs-i tried and failed ha! Guess im just an old-fashioned girl really). Now this is a subject mater im fiercely passionate about and i believe, if we whole heartedly awaken our people to fully comprehend the impact of proper nutrition and its place in medicine, no one would or even could consciously go back into the dark. Now when i talk about ‘Our Doctors’ and ‘hospitals ‘etc in this piece, i am in no way being detrimental to the effort or the service and the work they do. With what im sure, are 100% good intentions. Also when i talk of combining Eastern influences with our Western treatments i am not in any way implying our hospitals are not second to none. I truly think that the medicine we do well in this country , that is sought after the world over, is ’emergency medicine’ . Our ‘life saving interventions’ are simply the best. They are the most forward thinking, advanced and impressive the globe has to offer. What im saying is, let’s do this, lets free up our hospitals to provide emergency treatment and start tackling disease (largest killers in this country are Heart disease and cancers) on the home front. GPs are not even trained in nutrition, as a sole subject unit, in the 6 years they study! WTH??! This truly shocks me, when a diet rich in an assortment of vitamins and minerals, not only keeps you mentally and physically performing at an optimal level but prevents a large number of common illnesses and complaints that GPS are inundated with daily. It makes no sense to me why a government would spend millions of tax pounds on a campaign (we have all seen the posters ‘anti biotic won’t work on a cold’) to deter people booking appointments wanting a ‘quick fix’ medicine for a common cold virus, but the same government wont spend significantly less handing out Vitamin C. Why deal with the problem when you could mostly prevent it? I think i will start by talking about food with families, as our children, the next generation, are the ones we need to get this sorted for really. Plus im a firm believer that education really does start at home and you do need to lead by example. Thats not to say, before you roll your eyes at me with frustration… that i don’t ‘get it’, i do! Im as guilty as the next mum at popping a pack of 22p biscuits in my toddlers hand to get him to stop kicking off, bored at the supermarket….. or just for ten mins peace while i do the ironing! My kids have begged for A Macdonald’s milkshake and won! I’ve got in from work, tired out, nothing fresh in and put smily faces and spaghetti in front of them. I get it! I’m not saying its 100% 100% of the time, its moderation, BUT proper moderation, like a 95% 5% split. You, if your anything like me, need a guilty pleasure every now and then-christ, a few of you would have seen what a slice of carrot cake can reduce me to hahahahaha (inhaled in seconds flat) and a vody and coke barely settles in the glass hahahah !Its all about ‘real’ moderation. Also its portion sizes, an average child needs only 35 kcal to each pound of ‘ideal’ body weight, that means that no child under 7 is ever likely to be going to need more than a 1000kcal a day. Anybody that’s ever been on a weight loss diet will know that a 1000kcal isn’t all that much. So basically stop stuffing them up!! A child “learns” to like food, if you keep giving a healthy balanced diet, your child will, with no alternatives, eat a healthy balanced diet. It’s that simple. Teach your children about where food is from, go vegetarian if you think you can (vegetarians a no brainer for me, i cant get my head round why anyone would want to eat a dead thing, much less kill something to feed yourself when it’s not necessary to survival. Live by ‘first do no harm’…but from talking to friends i do understand that some people just will not give up meat or fish. And with the exception of the excuse ‘what difference will i make, they will still all be killed?’ this being the only reason that i just can not abide.) (Pathetic reason to eat something, if everyone thought like this no change would or could ever happen, one quiet voice is always better than no voice-but that’s a whole other blog!) I do understand some wish to get their protein mainly from animals so, make it lean white meats. Serve your families fresh fruit and vegetables ( now im not saying, as i will get to later, that our veg is up to much, but the calorie content, saturated fat content, sugar content etc is natures perfect balance) so load um up! Get the oats, the acai berries, the spirilium, the nuts… all the power foods into them-we are the generation lucky enough to have the research done for us already , now lets apply it. Whilst i agree that its close to impossible in modern-day Britain to get every nutrient needed for optimal functioning, i do think that this calorie controlled, low fat (still incorporating good fats), wholegrain, low sugar, no white/refined carbohydrate, vegetarian diet is the best thing you can do for both yours and your children’s health. Basically it’s getting rid of processed foods, its simplifying your food! If it comes straight from the ground its better for you! It’s not difficult or expensive (though im totally with you on the ridiculous comparison prices of vegetables and wholegrain food, make’s me so angry-but once you portion correctly i think most people find generally their bill goes down). A simple, cheap but brilliant breakfast will always be porridge-filling, boosts metabolism and is slow release energy, make it with water to avoid adding unnecessary calories and if you must sweeten it, chuck in a handful of raisins-job done, family fed! Don’t be afraid to challenge your children’s schools either. A lot of people prefer to send in a lunch box now anyway, which is great as you have total nutritional control. The schools all have a ‘healthy schools’ policies to adhere to now, which is a great step in the right direction, parents are asked not to put crisps or chocolate bars etc. in boxes….great, but what else is going in?! I’ve seen boxes packed to the brim with white sandwiches, yogurt, plastic cheese strings, cheese dippers, go ahead bars, jelly, strawberry mouse, mini bits of meat with biscuits and cheese, cocktail sausages, sausage rolls, pork pies! Stop and think! This meal needs to be around 300 kcal of their allowance! They really do not need any high sugar foods or heavily processed things that are going to make them lethargic or crash at some point, especially in school time (make the connection between food and good behaviour here too please, the more schools and parents recognize this, the less trouble and behavioural problems our children and young people will face). Don’t let others almost ‘pressure’ you-i know this happens because it’s happened to me! The teachers and other parents making snide comments and remarks about lunch box content. My children on a typical day take in water, yep that’s right, shocking parent, water…ha…a large whole meal peanut butter sandwich and one piece or a portion of fruit salad and one portion of either raw veg sticks or a yogurt. That’s it, that’s all they need, they get a glass of milk and piece of fruit at break time too. that lunch box has approx. 300-350 kcals in it . It’s that easy. Get them used to eating correct portion sizes now, they will thank you for it later i promise you. Anyway that follows on nicely to the next topic i wanted to discuss, as i said earlier, i don’t think much of the nutritional content of a lot of our foods now anyway. We are the benefactors of the third generation of super markets and massive commercial availability of foods. Great, cheaper, convenient and vast variety. What’s the cost of this though? The pay off is simply that our food is nutritionally raped before we get to it. Unless you are buying (truly) organic or growing your own food, it’s very likely, that because all of our soil has been worked and used so much, had fertilizers and other chemicals pumped into it for so many many years now, it lacks all the vital minerals , (there’s literally no magnesium left to be found in British soil now let alone the other 100’s needed) to grow well-balanced produce so the produce is substandard nutritionally. So then, by the time it’s harvested, treated, packed, sat in the store for 5 days, taken home by us, cooked (sapping any goodness it might have had left out…) we are left with a vastly inferior food product. However, this doesn’t have to be ‘throw in the towel time’ ! We are the generation lucky enough to be able to benefit from modern science and all the research done, as we can find vitamin supplements readily available to us. Now this is where i have countless debates with my co-workers and such like, as some people are vehemently against this. The belief is firmly that you should be able to get everything you need from a balanced diet, well i have just explained my reasons why i don’t thing this is happening anymore. Also its about breaking down the misconceptions that are placed in people’s minds that these are ‘tablets’ or ‘drugs’ or something, they absolutely are not. I’m all for a natural diet (and against taking prescription drugs at all costs obviously ) but if i can swallow, in one mouthful, enough iron, vitamin A,B,C and D for my day before i even eat, then brilliant! If i had a penny for every joke that i get in the mornings at work “you’ll start rattling soon Bec” etc etc id be rich! Yep, i shoot wheatgrass and vitamins like they are sambucca and i make sure i get above and beyond my fair share of B3′ and 12’s to aid my vegetarian diet. But like with anything there is a side to be weary of, do your research, RDA are not always right for one (shocking, the government being wrong eh?! …;), certain things you can get cause negative side effects by having too much of ….but things like Vitamin C, you really cant get too much of a good thing! 100mg a day RDA WTH?? I make sure i get a minimum of 1000mg daily at least. This is where media stories and propaganda shuffles through hazy memories, have you not heard that too much can damage your liver some where before, or was it Kidneys?? Yep, you probably did read that somewhere but it’s absolutely unfounded and in fact completely discredited by the research since carried out. ….. So you think you have decided to get on to the optimal health train, want to wake up feeling refreshed and rested, mind and memory sharp from all those rich Omega oils your feeding your body, hair and nails glossy from the biotin, cells regenerating and energy from all the B vitamins and extra Iron?? Then you get faced with the next major hurdle in this battle to overcome. This too, like the prescription drug empire, is a multi billion pound business and with that comes all the hard sell pitfalls to avoid. It’s not as easy as walking into Tescos and buying your generic multivitamin! Sadly, if you actually look at the quantities in these, they might be at the “government recommended” mg pitch, but nowhere near what you would need to actually feel different and boost your body. There are however some great, reputable internet sites and sports nutritionist are the best folk to speak to here for some great recommendations. So this sounds like i got a bit side tract from my original topic of its place in Medicine. But i thought id put a bit of background in first. The thing that i oppose so strongly in our medical system is its heavy reliance on pharmaceutical companies and drugs . Firstly i don’t trust multi billion pound corporations that happen to have control over what information is added….. and conveniently, edited out of our medical journals! Money really does and always will talk loudly in the minds of the corrupt or the money needy (our government!!). The truth, however, if shouted loudly by anyone fierce enough to oppose what is happening, will always, in my eyes, be not only the more worthy but the leading voice into the next movement. With death, obesity and disease rates so high and medication side effect reports becoming more concerning and at times horrifying, can we afford to be the generation that doesn’t stand up?? Is this the last chance we have to fight and to speak out for our children’s generation not to live in a world where coronary heart disease, diabetes and 1 in 2 people developing a cancer of some variety is the norm??!! Lets stand up and make our words heard then!! pharmaceutical companies have screwed us over for a profit …..and as a country we have let them! We, in western medicine and culture like to have a drug that does just one thing, to coin a famous phrase “a pill for every ill”. It seems too unlikely or too difficult to comprehend when someone says a certain food or herb or nettle ect will treat several ailments etc !! We need to start giving medical weight to these things though. If you look to the East and their statistics on disease, its absolutely nothing like ours-food really does matter! However these drugs companies are powerful and their money keeps them in our governments pockets. They are not going to relinquish any ruling over our medical practices any time soon -and please don’t think im saying all drugs are bad, like i said earlier our ’emergency medicine” is second to none the world over. Drugs are part of that success story, but long-term medication, no, absolutely not, not how our bodies were designed. There has to be and is another way. There are people campaigning tirelessly across the globe that are being silenced as we speak. Its called the ‘forgotten research” It’s basically the stuff left out of our medical journals because it doesn’t make money. With risk of sounding like a conspiracy theorist, even cancer has become a billion pound industry for America and Britain. There are doctors that have had to move their families into Mexico just to practice their Medical techniques-that have had success rates far higher than we are used to in the treatment of cancer..because its illegal to practice these (un costly) things in western medicine! The founder of alcoholics anonymous, also used niacin in his recovery program and wanted to include vitamin therapy into his program but the medical board would only allow it to go ahead as a completely ‘spiritual’ group. How controlling?!!! Money!! The research has been done, we are not in the dark. We have just been silenced and manipulated into believing we are getting the best when in fact we are playing in to a business strategy. 38 degrees and many others have done blinding work going head to head with Abbie v drug company (to get transparent date-these people were hiding side effects (legally!!!) with no concern for the devastating life effects on people…just concerned with selling more ) It’s a start but only a start. Lets be the generation that stands up and shouts, no! 1 in 4 are the stats now…..that’s 1 of my kids! Impossible………don’t keep quiet, don’t meekly except what’s available to you! enquire, be curious, ask questions….demand answers. Do it for the next generation, a brighter legacy. This entry was posted in Uncategorized on 27th September 2017 by DCInjuryClinic. The wrist is a complex joint made up of eight small bones arranged in two rows between the long bones in your forearm (ulna [little finger side] and radius [thumb side]) and the bones in your hand. 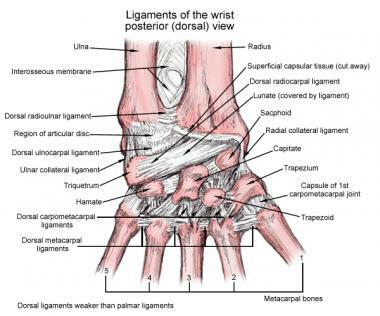 Tough, fibrous bands of ligaments join your wrist bones to each other, and to your forearm bones, and to the hand bones. Tendons attach the muscles to bones. All told, its a pretty complex area. Wrist injuries occur frequently both in sport, and occupationally. Occupationally, they are often deemed overuse, or repetitive strain type conditions. This can be any activity that involves repetitive wrist motion which can cause inflammation of the tissues around joints – so anything from using a desk mouse all day, using your thumb all day on your phone, or using a screw-driver for long hours. In sport, they often occur due to a fall on the outstretched hand, and are more common in children than adults. In sportspeople, the most common acute injuries are fractures of the distal radius or scaphoid, or damage to an intercarpal ligament. A scaphoid fracture involves the bone on the thumb side of the wrist. This type of fracture may not show up on X-rays immediately following the injury, and can easily be missed. It is essential to determine the mechanism of the injury causing wrist pain, and examination should include observations, active and passive movement tests, palpation, and special tests. Osteoarthritis is a type of arthritis which occurs when the cartilage that cushions the ends of your bones, allowing smooth articulation, deteriorates over time. Osteoarthritis in the wrist is actually fairly uncommon and usually occurs only in people who have injured that wrist in the past. Rheumatoid arthritis is a condition in which the body’s immune system attacks its own tissues by mistake and is more common in the wrist. If one wrist is affected, the other one usually is, too. Pain associated with rheumatoid arthritis is usually described as throbbing or aching, and it is often worse in the mornings or after a period of inactivity. Carpal tunnel syndrome develops when there’s increased pressure on the median nerve as it passes through the carpal tunnel, which is the passageway in the palm side of your wrist, between ulna and radius. The main symptoms of carpal tunnel syndrome are tingling, pins and needles, numbness and pain in one or both hands. The symptoms tend to have a gradual onset, and can be worse at night or first thing in the morning. Ganglion cysts are fluid-filled lumps that usually develops near a joint or tendon. The cyst can range from the size of a pea to the size of a golf ball, and are common wrist complaints – mostly on the top of the wrist. Ganglions are harmless, but can sometimes be very painful! De Quervain’s Tenosynovitis is a painful condition affecting the sheath around the tendons on the thumb side of your wrist. Symptoms include pain when you turn your wrist, grasp anything or make a fist, and grip strength will be compromised. A plumbers worst nightmare. Wrist injuries are common in A&E Departments, and often easily and quickly ruled out from being broken. But what then? This entry was posted in Uncategorized on 7th August 2017 by DCInjuryClinic.